Borderlands Claptrap USB Hub | Nerd Much? Thinkgeek has done it again. 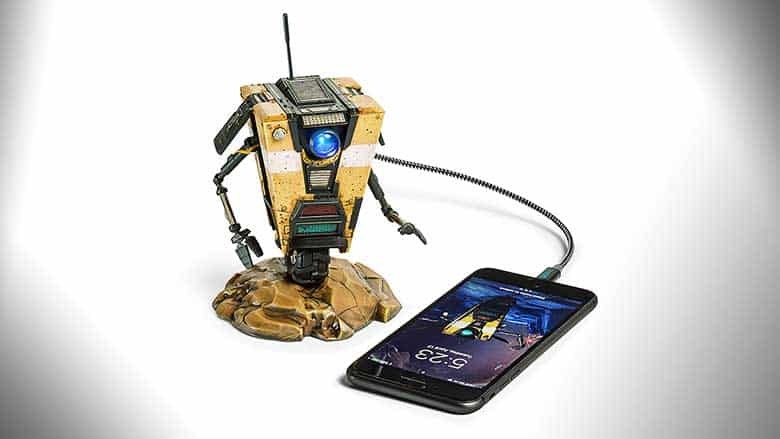 Combining our favorite general-purpose robot from Borderlands and our perpetual need to charge our electronic devices — and now we have found a truly amazing piece of Nerd merch for you: the Borderlands Claptrap USB Hub that talks when you charge your stuff. How often do you find yourself, waiting to charge devices because you got to the only available outlet last? It is a common problem these days. Well worry not, because your favorite claptrap robot from Pandora is here to fulfill all of your charging needs, and does it with that eccentric Claptrap personality you have come to love. The Claptrap USB Hub features four separate ports for your charging convenience, so you can charge all your devices at the same time, and let’s face it time is of the essence no matter what planet you are on. It is even capable of transferring USB data (at a speed of 480 MPS) and charging simultaneously, so you can get even more done. We could all use a little extra positivity and charisma in our lives, why not get yours with this talking Claptrap USB Hub? If the chatty robot from Borderlands isn’t your thing, then you may appreciate the included mute button. This officially licensed Borderlands merchandise is compatible with any device that charges via USB as long as you have the necessary cable. This ThinkGeek exclusive is currently priced at just $39.99 and is available to order now (via the link below). Buy it at ThinkGeek here. Malissa is a book lover, board gamer, writer, crafter, disc-golfer, Hufflepuff and professional chef currently researching sustainable agriculture on the family farm. She spends her free time enjoying craft beer and board games with family and friends, and binge-watching Bob’s Burgers.